In 1982 a film called Tron appeared on the silver screen. It was without a doubt one of the most hyped films of all time. I remember seeing the ads, being excited about the possibility of such a movie with never before seen computer graphics. The line to get in was long. Chatter was everywhere. Anticipation was running high. When the film ended, there was no joy. To put it politely it was horrible. Not bad, horrible. The graphics were underwhelming (I saw better with Logan’s Run), the storyline was boring. Overrated was the universal opinion by moviegoers. The same can be said for Cornerstone OnDemand. Everyone wants to see it. The hype on the product was huge, after all, the company’s revenue has increased significantly over the past two years. I thought to myself – “wow, this is going to be great”. Afterward, my feelings changed. Just as they did with Tron. Social Learning in general – can’t anyone come up with something fresh? Additional charge for “Connect” their social learning set, unless you purchase the Extended Enterprise Cloud (then it is included). With more systems including a solid social learning component, it should be included in all their products at no additional cost. COD provided me access to their “Learner” and “Performance” clouds. You do not have to purchase all their clouds, rather you can pick and choose. Performance – according to COD many of their customers only want this cloud. The cloud comes with succession, performance and compensation. Upon entering the LMS, you will see the home page. You can customize it with your own look and feel. The home page also lists a series of headers, which I would state are similar to tabs. As noted before, you can decide which sub headers you wish to include, as well as tabs. One of the most interesting features of COD is the way to view courses/content/materials etc. While most systems enable this with simply clicking “course catalog” and/of offering a keyword search, COD offers three ways. Advanced search – recommended by COD as the best method. 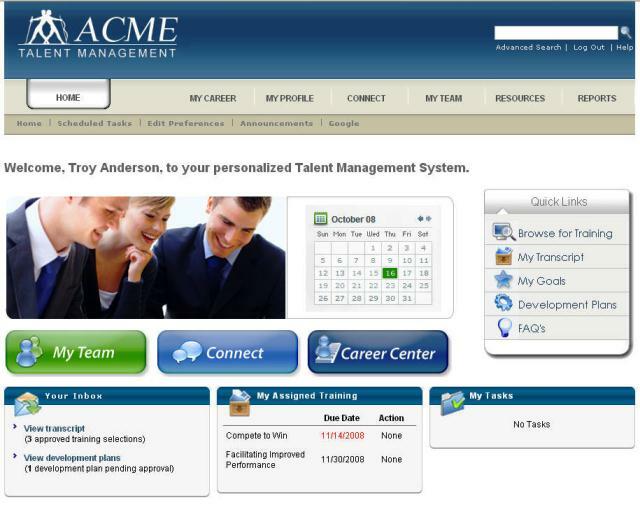 I found it to be worst especially for end users who are totally brand new to a LMS or e-learning in general. For me, “browse for training” seemed to work the best, especially for newbies or those of us with limited patience. Regardless of the option you select, the screen will go to the catalog area whereas a toolbar is viewable by all. If you decided to go with “Advanced Search”, the toolbar appears with all the boxes checked and you will see everything in the catalog. Let’s stop right here. One of the most irritating components of this catalog is this darn toolbar. While it may suggest simplicity, I found that hardly the case. Part of my reasoning is because of how COD defines terms within each little area. On more than one occasion, a learning item could appear in multiple areas, thus creating redundancy. In my initial discussion with COD, defining an online class was no easy task. Especially when the redundant factor kicked in. Resources – docs, video/audio files, podcasts, PPT, etc. In all my years, I cannot recall one time I was asked to take a test within a LMS that was not part of a course. Sure, if you offered the GRE, that would qualify under test not related to any course, but why have that within your system? I’m not going to lie, but this was an exhausting catalog search when selecting the advanced search function. Sure, you can go with a keyword, but considering that most people do not use keywords, let alone wildcards, stating that this is the best method to find what you are looking for in a catalog is hard to believe. 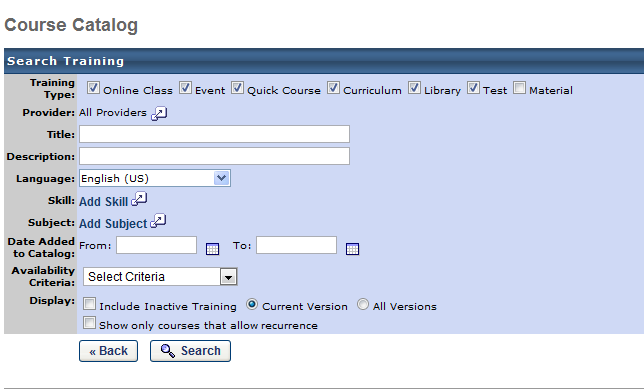 Here is the window for the course toolbar. As you can see it includes some filtering options. I strongly recommend using the filters for the catalog, especially if you have a significant amount of content contained within. While I could continue with the variety of different windows on the end user side – because this is an extensive system – it makes sense, especially in time constraints to jump over to the admin side. Let me be very clear on this – the admin side is extremely robust but at the same time, cumbersome. Before delving into this side, grab a cup of coffee or tea and listen to the soothing sounds of Booker T and the MGs. Take a deep breath, because we are off on a wild ride. As aforementioned, this may be one of the most robust admin sides I have ever seen. But seeing can be deceiving, especially with COD. Don’t get me wrong, the feature set and capabilities are all there – perhaps more so then needed – especially if I am not selecting the Extended Enterprise Cloud. I found the admin side on the whole daunting. Unless you have solid experience being an administrator or lots of time, the amount of info, features and capabilities can be overwhelming. At times I felt exhausted and wondered out loud if someone who had zero tech skill sets could utilize this product on a daily basis without cursing their superiors. I can’t decide. Part of the problem I had with the administrator side was the lack of a home dashboard. With people today having so little amount of time, this could be a very useful and beneficial feature for any administrator. Yet the product prefers to go with the toolbar and sub set of options. 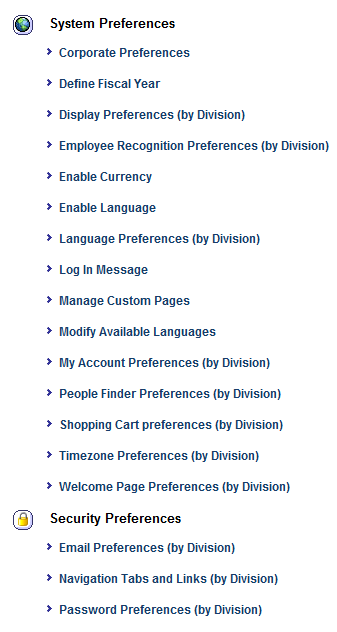 When you selected any of the above options, an extensive set of choices are visible. Let’s take a quick look at the options under “course catalog” that the administrator can set. Without turning this review into the next “The Blah Story” (with a reported 7,300 pages and yes it is a real book), I wouldn’t be doing COD justice unless I informed you that this solution offers a lot of reports, from within you are offered an uber selection of choices. The product also features a very impressive assessment tool which is worthy of an “A”. Again, lots of capabilities as part of the tool. This isn’t a bad system, but it is not a system that can match up with some of its other competitors in this space. I’m sure COD will argue that people have options – lots of options, that their end users and clients love the product, and that people always want more then less. Yet, research on the brain does not back this up. Studies in neuromarketing have found that although consumers say they want lots of options, in the end they find it difficultly in selecting which ones best meet their needs. It is all tied to how the brain works. But you do not need research to present information that many folks in e-learning already know – that people tend to use the same features over and over again. Thus, having more isn’t always a good idea. Unless you are like the band Queen and want it all. We are looking for an LMS, where on your site could you pull all your reviews so that you rank the LMSs? I am not sure which LMSs are its competitors in this space. if you go to my LMS directory which you can find on the main page – it will provide you all the info you need.